As someone who has been practicing law in Tucson for more than six decades David Burr Udall has a lot of stories to tell. There was the time he put Jonas Salk, the inventor of the polio vaccine, on the witness stand when Udall’s drug company client was sued. And the times when his partner represented reputed mobster Joe Bonanno. For the most part, though, Udall, who goes by Burr, said that when a case is over, he doesn’t dwell on it and moves on to the next one. While he doesn’t reminisce much about the cases themselves, he remembers Udall Law Firm’s early history like it was yesterday. “The firm started March 1, 1952 and was called McCarty & Chandler,” for its founders Charlie McCarty and Tom Chandler, he recalled. “They were downtown in the old Valley Bank building, then moved to 177 North Church. That’s when I came, February 10, 1954.” That was right out of University of Arizona law school. “I always wanted to go to U of A,” said Udall, who grew up in St. Johns, Arizona. He was the youngest of six siblings, including his famous brothers Morris and Stewart Udall, both of whom enjoyed prominent political careers. It didn’t take long for Udall to earn his own identity as an attorney. In 1955, he was made partner and his name was added to the McCarty & Chandler name. 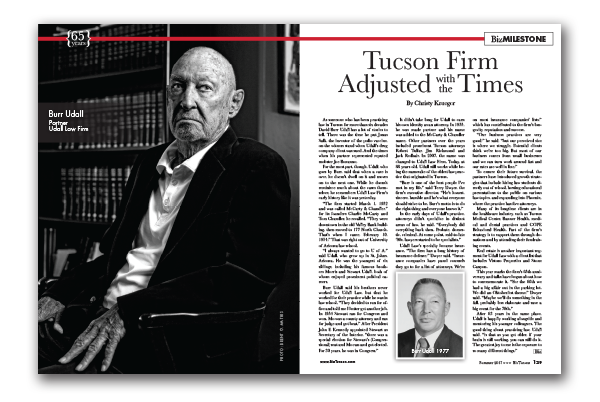 Other partners over the years included prominent Tucson attorneys Robert Tullar, Jim Richmond and Jack Redhair. In 2007, the name was changed to Udall Law Firm. Today, at 88 years old, Udall still works while being the namesake of the oldest law practice that originated in Tucson. Udall Law’s specialty became insurance. “The firm has a long history of insurance defense,” Dwyer said. “Insurance companies have panel counsels they go to for a list of attorneys. We’re on most insurance companies’ lists,” which has contributed to the firm’s longevity, reputation and success. To ensure their future survival, the partners have introduced growth strategies that include hiring law students directly out of school, hosting educational presentations to the public on various law topics, and expanding into Phoenix, where the practice has five attorneys. Many of its longtime clients are in the healthcare industry, such as Tucson Medical Center, Banner Health, medical and dental practices and COPE Behavioral Health. Part of the firm’s strategy is to support them through donations and by attending their fundraising events. Real estate is another important segment for Udall Law with a client list that includes Vistoso Properties and Stone Canyon.